Synchronization systems can simply be described as utilizing more than one generator set for your high kVA needs. Small generator sets operating in parallel offers all benefcial advantages of a single large generator set. As you can see at above comparative cost graphic the synchronizing systems which gathered from different kVA models bring more advantages both in purchase and also in after sale. 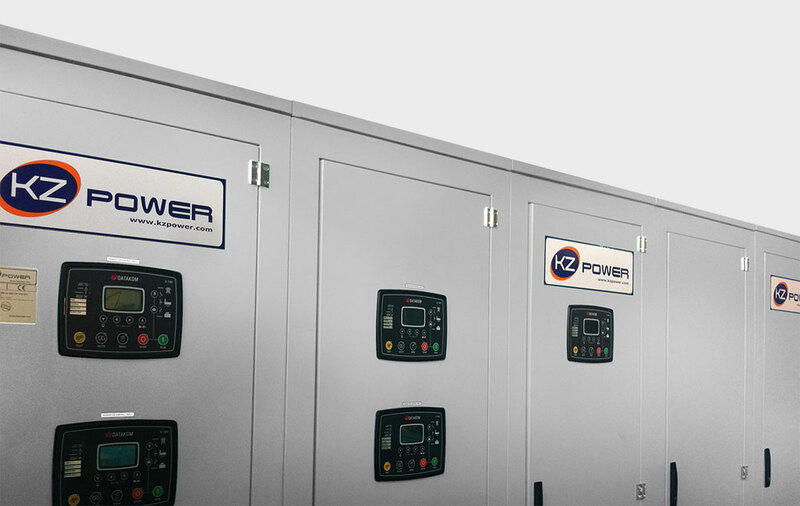 We can approach to flexible usage of KZ Power Synchronization Systems from both logistic and functional point of view. On the contrary of common belief synchronization systems can be synchronized not just in equal powered generators but also in different powered models. As a result of this application a flexible solution is created for changing power at different time of year or different time of day. In a hotel that needs intense power at summer time, is not also going to need same power at winter time. With the synchronization of different powered generators the intense power need of summer cover by high and small generator synchronization the other hand you can use the lowered power single generator according to compensate the power for the off seasons. Thus fuel expenditures and corrosion are minimized. In logical point of view, multiple generator systems create substantial advantages against difficulties of setting up systems with single large generator.